Many big enterprises and network cabling solutions providers prefer hosted telephony service because of its many advantages over PBX telephone system. Following are the major factors to be considered while choosing between PBX and Cloud-based telephone systems. The cloud-based telephone system is suitable for both small and large-scale businesses as there is less capital investment required to install the system. Since there is nor hardware necessary, there is a reduction in storage space required and power costs related to servers. On the other hand, PBX requires hardware installation. The cost of system installation increases with increase in the size of the hardware. The installation time required for the cloud-based system is less as compared to on-premise PBX solution. The DIY approach to implementation for cloud-based telephone systems make the installation work much easier than on-premise PBX solution. PBX solutions are needed to update over time. Replacing the hardware or updating new features can take many weeks to integrate. This may cause inconvenience for communication which will be required to schedule to reduce the trouble. On the other hand, there is no need to halt the on-going communication while implementing cloud-hosted solutions. The software is updated automatically, and the updates are maintained by the cloud service provider. Cloud, hosted solutions are more popular among the companies because of their flexible and scalable nature. Cloud hosted solutions allow companies to easily add and remove the lines without any expenditure. Also, you need to pay for what you use. Advancement in technology has helped hosted PBX systems to render clear quality of voice during calls. 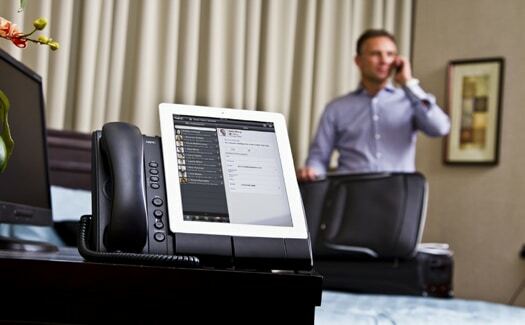 Cloud technology is very much more secure than traditional PBX technology. All your data will be stored safely with recovery solutions. Installing the cloud-hosted telephone system with less money investment and low cost of owning your company can enjoy quality services that will maintain your business standard in this competitive marketplace. Telecentric provides the best cloud hosting services at affordable prices.